A study of 341,000 people by the National Academy of Sciences in America showed that overall enjoyment of life tended to decline slowly throughout early adulthood, rising again from around the late forties or early fifties to reach a maximum around the age of 85. Several factors apparently are at play, including maturity, diminished responsibilities and the ability to focus on the things that matter rather than chase elusive goals ! It certainly correlates with our home care clients who we are certainly a happy and contented lot. 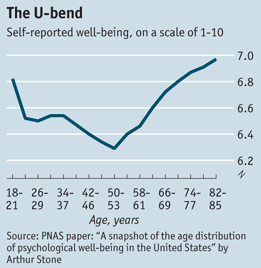 The bad news for those of you in your 40's , it seems at 44 you are at your most depressed ! !